Giants Software launched their newest installment to the Farming Simulator franchise in October 2016. The series, from publisher Focus Home Interactive has been the strongest running agriculture sim title on the market [EN: What of Harvest Moon?]. Many have tried to copy their formula, but loyal fans keep coming back to the series year after year, in part because the implements and models in the content packs often add additional play time to the game, along with the enjoyment of diversifying your inventory. The second DLC release for the most recent title (Farming Simulator 2017) is the anticipated Big Bud Pack. The Farming Simulator series is available on many different platforms, which aides in establishing and keeping the following it currently enjoys. However, as usual, PC remains king, since the developers have done a fantastic job basing their game around the inclusion of mods. Each title, Farming Simulator 2017 included, consists of two maps out-of-the-box. 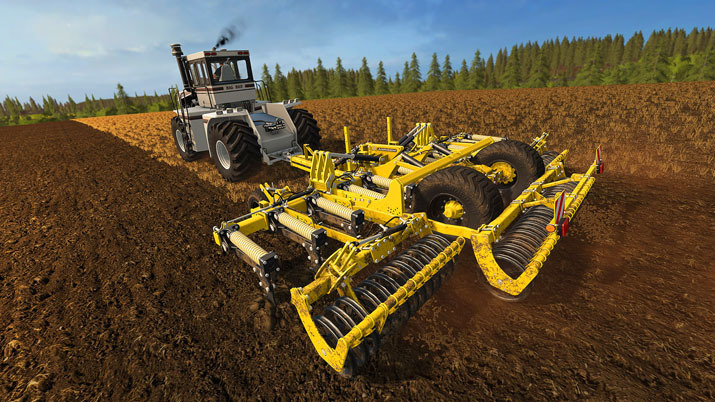 These are carefully crafted maps that allow for the large variety of features of the game, such as logging and silage production, on top of the obvious planting and harvesting, which can be experienced in a single playthrough. It’s not long until new maps hit mod hosts, including the mod hub run by Giants Software themselves, which allows for diverse landscapes and the ability to focus on the specific tasks which players prefer. Many players, especially those of us in North America — where it’s difficult to find fellow sim gamers — shy away from maps with a large field size. Some fantastic maps include large fields, assuming there is a team working the land, but individuals just can’t keep up with the demands of such a large farm. 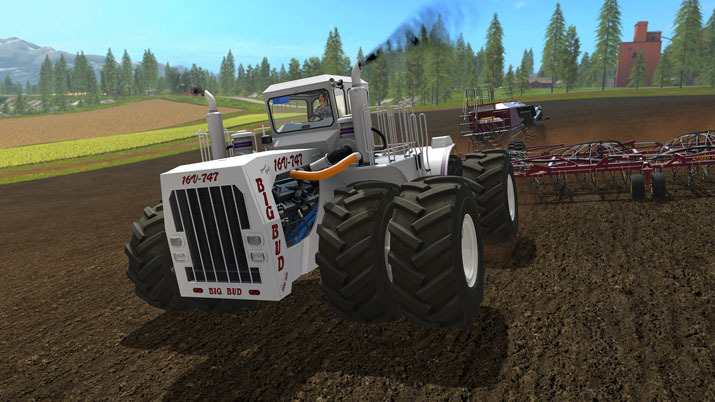 However, Giants Software comes to our rescue with the 16-V 747 Big Bud Tractor to ease these concerns. Giants built the entire DLC pack around the “worlds largest tractor,” the Williams Big Bud 747, and it’s little brother the Big Bud 450. The Big Bud 747 is a massive, one-of-a-kind tractor built in 1977. It weighs over fifty tons, and the 1,472 cubic-inch Detroit Diesel engine, which initially put out around 760 horsepower, but now, with two turbochargers and two superchargers, tops out at a staggering 1,100 horsepower and 3,100 lb-ft of torque — almost twice that of tractor trailers on the road today. Giants even included an option to add a third set of the eight-foot tall tires to the 747, giving you not eight, but twelve points of contact to deliver that power to the earth beneath you. This tractor has the size and strength to perform any job you can throw at it. The original owners put that power to use by pulling an eighty foot-wide cultivator for deep ripping their fields, breaking up compacted ground as deep as fifty centimeters. These machines are not strangers to hard work, and the pack comes with an array of large implements for these monsters put to use. The kit includes twelve new tools, including a gigantic, state-of-the-art SeedHawk seed and fertilizer system, as well as all new cultivators, fertilizer spreaders, plows, and auger wagons. The detail on each of these tools is fantastic. When looking at the new pieces in your agricultural arsenal, it’s clear that a significant amount of effort went into each of these models. The interiors and exteriors of the two vehicles were fantastically modeled and looked great, even down to the exposed spinning cooling fan. Unfortunately, while a lot of details were picked up, there were a few that left me wishing for more. There are very visibly apparent hydraulic connections on the back of the tractors, and because of the size and shape of the vehicle, it’s clear that nothing is connected to these which would waste the one-hundred-fifty gallon hydraulic tank touted by the vehicle. I was hoping that, when attached to the implements included in the pack, at least those would have hydraulic lines connected, but alas they were left exposed and empty. The sound of the Big Bud themselves was also not to a level that I would have liked. The audio asset in the game doesn’t do justice to the tremendous roar found in videos of the actual vehicle. Unfortunately, the inclusions of a couple of large vehicles will not be enough to get anyone into agriculture sim games. The large appeal of the games is a kind of zen experience, the ability to live the dream of working the land, if only for a few moments (Though players I’ve met, most of them in Europe, have put upwards of two- or three hundred hours of playtime into this franchise as a whole). If you don’t have a large crew then some of these fantastic but enormous maps can be daunting as a solo player. The inclusion of the Big Bud DLC has alleviated that and gives you the opportunity to plant and harvest those large fields very quickly, making extensive farms more manageable. I only wish it included a set of oversized harvester heads to match. The primary concern surrounding this DLC is the price point. The pack consists of two finely detailed tractor models and twelve large implements to go with the massive power the new tractors provide. These are great additions to the game, but at $14.99 the pack is nearly half the price of the full title. It’s hard to justify such a transaction unless you love these particular machines or if you’re a real fan of Giants Software and you just want to support them. The decision can be a difficult one, especially since there is an option to pick up large tractors and implements from modders, as long as you’re willing to put the time and effort into finding them, and take the risk of downloading large zip files to install and play the mods. The price point of the Farming Simulator: Big Bud DLC is pretty high for the content that it includes. While the models are fantastic and a cut above mods of the same machines in earlier installments of the franchise, the pack will not convert the average gamer away from their favorite FPS title and into tractor seat. However, if you are a solo farmer looking to tackle bigger maps and larger field sizes, but don’t have a community of players with which to work your fields, then this pack may be right up your alley. It certainly added the pieces I desperately needed for my own farm.